A fall update on business and the economy will be presented by the Indiana Business Research Center and an Indiana State University economist on Nov. 16 in Terre Haute. Robert Guell, professor of economics, will provide insight about the Terre Haute economy, as well as economic conditions in Indiana and the rest of the country during the Fall Business Outlook at the Holiday Inn on U.S. 41 in Terre Haute. Jerry Conover, director of the Indiana Business Research Center at Indiana University, and others will discuss business and the economy during the event. The Fall Business Outlook is hosted by the Terre Haute Chamber of Commerce and co-sponsored by Terre Haute Savings Bank, the West Central Indiana Small Business Development Center and the Scott College of Business at Indiana State. "This new event for area residents provides an updated outlook for business and presents analysts' views on how economic conditions will unfold," said Nancy Merritt, dean of the Scott College. "It was planned, in part, because of the positive responses and attention given to the Groundhog Day Economic Forecast, which is hosted annually at ISU in February. " At the most recent February event, Guell predicted that the economy would slowly grow and add jobs. He will provide an updated forecast, as the economy and unemployment continue to trudge out of the remnants of the Great Recession, and as the economy continues to be influenced by the European financial crisis and has helped spark the Occupy Wall Street protests that have unfolded across the country, including Terre Haute and other cities across Indiana. "Professor Guell is a well-informed and dynamic speaker who is on top of the local, regional and national economic environments," Merritt said. Conover and the Indiana Business Center will present business forecasts based on research in their Outlook Tour, which includes Indianapolis and several other cities in the state, Merritt said. This event is now an added stop on the group's itinerary. 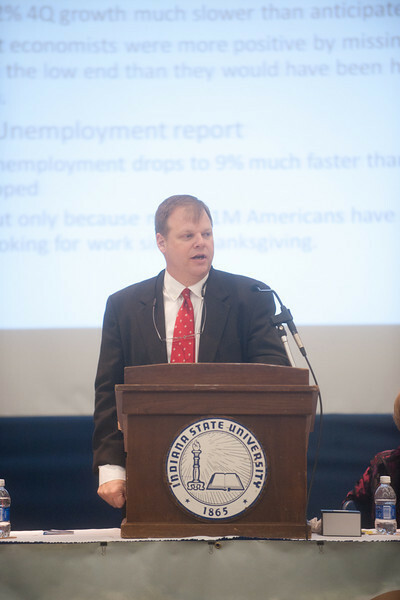 Robert Guell, professor of economics at Indiana State University, speaks during the Groundhog Day Economic Forecast event in February. Guell will be among the speakers at the Fall Business Outlook on Nov. 16 at the Holiday Inn on U.S. 41 in Terre Haute. Contact: Nancy Merritt, dean, Scott College of Business, Indiana State University, 812-237-2000 or nancy.merritt@indstate.edu. Writer: Austin Arceo, assistant director of media relations, Office of Communications and Marketing, Indiana State University, 812-237-3790 or austin.arceo-negrich@indstate.edu. Robert Guell, professor of economics, will provide insight about the Terre Haute economy, as well as economic conditions in Indiana and the rest of the country during the Fall Business Outlook at the Holiday Inn on U.S. 41 in Terre Haute.